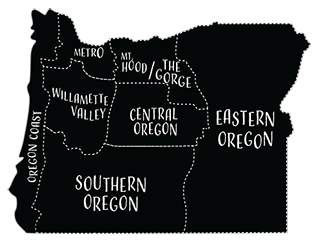 More than 700 wineries now dot the Oregon landscape. Chardonnay and sparkling wines surge in popularity. Travelers to wine country can experience big, small, fancy or casual tasting rooms in a downtown or in the country where the winery may also raise the meat for its charcuterie plate. 1859 spoke with people all over the state to get the buzz on the industry, parsed out by major growing regions. Find the highlights on what’s trending, where to visit, places to eat and other helpful information. The glasses are out, now it’s your job to fill them. Sparkling wines are lifting off all over the north Willamette Valley, and one enterprising winemaker is boosting the trend. Andrew Davis, a seven-year veteran of Argyle Winery, the region’s leading producer of sparkling wine, founded Radiant Sparkling Wine Company in 2013. He supplies equipment and know-how in the traditional method or méthode champenoise to twenty winery clients. Demand has grown so fast that Davis is preparing to scale up production. “I was blown away at the desire of the local community to make bubbles,” he said, adding that vintners often don’t have the technical background or equipment to make the leap into sparkling wine. For the founding families who built Oregon wine into an international brand, it’s a compliment to them that out-of-state and international winemakers are coming here to be part of the evolution of progress, said Reagan Nauheim, general manager of the Joel Palmer House Restaurant in Dayton. Among the first wine immigrants to the Willamette Valley was Robert Drouhin of Burgundy, France, who orchestrated the now-famous blind tasting in Burgundy in 1980 in which Eyrie Vineyards’ pinot noir placed a close second to his own wine. His family opened Domaine Drouhin Oregon winery in 1989 in the Dundee Hills. More recently, Chateau Ste. Michelle Wine Estates of Woodinville, Washington, acquired Erath Winery in 2006, and Jackson Family Wines, Inc. (Kendall-Jackson brand) of Santa Rosa, California, has four wineries, including Gran Moraine that opened in 2014 on property formerly occupied by Soléna wines. The Jackson family recently acquired two buildings at Evergreen International Airline’s former headquarters near McMinnville for additional wine production. With all the expansion—500 wineries and counting—the north Willamette Valley is still mostly family run, with a community that pulls together. Nauheim tells this story: When the owner of Brooks winery, Jimi Brooks died suddenly in 2004, just days from harvest, some of Oregon’s best vintners rallied around the family and made wine in Brooks’ honor. They continued to help in the following years to ensure that his sister, Janie Brooks Heuck, and his son, Pascal, could continue making wine. Acclaimed winemaker and a founder of Argyle Winery and more recently ROCO, Rollin Soles and his wife, Corby Stonebreaker- Soles, bought property in the Chehalem Mountains in the 1980s but waited till 2001 to plant vineyards. Their first pinot noir called Private Stash was served at the White House. They built a winery in 2009 and tasting room in 2012. ROCO will release its first sparkling wine this fall. Marc-Andre Roy and Jared Etzel, sons of Beaux Freres Winery founders, started their own winery in 2012, and grow pinot noir and chardonnay at a vineyard in Dundee and another in Carlton. Their tasting room in Dundee, which they describe as “barnitecture,” opened in late 2015 and was built from reclaimed wood from a single Eastern Oregon barn. Owned by Jackson Family Wines, Gran Moraine, which opened in 2014 in Yamhill, offers private, seated tastings of estate-grown chardonnay and pinot noir in a semi-formal environment and some guided tours. Call ahead for an appointment. Jimi Brooks started Brooks in 1998 with little more than bottles and labels. Twelve years after his death in 2004 and with help from twelve Willamette Valley wineries, the Brooks label has its own vineyards, winery and tasting room in the Eola-Amity Hills. The staff likes to say that Brooks has “a pinot noir program that supports a riesling addiction.” Both varietals are offered in the tasting room, along with other wines, meat and cheese nibbles and sweeping views of the Cascade Range. Originally a grass seed farm, Saffron Fields in Yamhill planted pinot noir grapes in 2007 and released its first vintage in 2010. The modern-style tasting room with Japanese gardens and a modern art collection opened in 2013. Sit on the patio with a glass of pinot noir, chardonnay or rose. Amid pinot noir vineyards in the Chehalem Mountains is this boutique vintner’s comfortable tasting room in a 1910-era barn, complete with 145-pound St. Bernard, Sophie. Owners Dave and Mary Hansen, along with two French winemakers, craft several varietals for their clients’ enjoyment. In March, King Estate Winery, one of Oregon’s largest producers and the winery often associated with making pinot gris a staple of white wine lovers, achieved a long-awaited goal. The Eugene-based, family-owned winery is now part of the Willamette Valley American Viticulture Area (AVA). The U.S. Treasury Department’s Alcohol and Tobacco Tax and Trade Bureau, which oversees wine growing regions, extended the 5,360-square-mile Willamette Valley AVA by 29 square miles. The expansion incorporates both King Estate and adjacent Iris Vineyards. It’s the first expansion of the AVA, and only wineries within the borders can use the AVA’s name in marketing materials. “Now we can add that our estate wines are from the Willamette Valley AVA,” said Ed King, CEO and co-founder of King Estate. As a vineyard grower, Dai Crisp is always adjusting his techniques and grape varietals based on changing market and climate conditions. “We used to have a more leisurely harvest but now harvest seems more compressed, requiring sustained hard work until all the fruit is in,” he said, referring to the recent warm summers in the valley. Since 1999, Crisp has managed the esteemed Temperance Hill Vineyards located in Eola-Amity, a source of pinot noir, chardonnay, gewürztraminer and pinot gris grapes for twenty top Oregon wineries, including Crisp’s own company, Lumos Wine, west of Corvallis. The South Willamette Valley wine region runs along the I-5 corridor, with most wineries on the west side of the freeway, from around Albany to south of Eugene, and includes sixty-seven wineries. Crisp said that it’s common for winery visitors to meet the people who grow the grapes and also make the wine. Steve and Carol Girard bought an old sheep ranch that straddled the border of Benton and Lane Counties (thus the name) in 1988 and built it into a winery that sells its estate-grown pinot noir, pinot gris and chardonnay in all fifty states and around the globe. It was the first Oregon winery to eliminate corks in favor of screw tops. Relax on the tasting room patio or reserve a tasting and private tour with the founders. The site of this winery has been in the hands of the Buchanan family for 131 years. Dave Buchanan and his wife, Margy, planted grapevines on the property in 1974, making them early wine pioneers. Their daughter, Marilee, a fifth-generation Buchanan, is Tyee’s winemaker. A converted dairy barn serves as the tasting “parlor” where visitors can sample the estate-grown pinot noir, pinot gris, chardonnay and gewürztraminer. If there’s time, stroll along the Beaver Pond Nature Trail—half of the farm’s 450 acres has been restored to wetland. Celebrating its twenty-fifth anniversary, King Estate has played a major role in bringing Oregon wines to Americans with a palate for pinot noir and pinot gris. Today a third generation of the King family is continuing the sustainable agriculture practices of the founders, and this year the winery became the largest biodynamic vineyard in the country. Give yourself time to savor this idyllic estate complete with organic gardens and orchards, lavender, bee hives, vineyards, winery, tasting room, a restaurant and on-site charcuterie and bakery. Passionate about wine and highly respected, Dai Crisp started Lumos in 2000 and makes small-batches of pinot gris, pinot noir, gewürztraminer, sauvignon blanc and muller thurgau at the winery in McMinnville. The fruit comes from three certified organic vineyards, including the estate vineyard in Wren. Relax at the Big ol’ Barn opening this spring in Wren or stop by the other tasting room in McMinnville. Mt. Hood Winery was recently named the 2016 Oregon Winery of the Year by the Wine Press Northwest. According to Andy Perdue, the magazine’s publisher, Mt. Hood Winery was selected for its legacy of farming and operating in the Columbia Gorge and a recent history of producing great wines, including its 2014 Estate Pinot Noir, which won the best Oregon wine at the 2016 Cascadia Wine Competition. Traveling into wine country isn’t always transcendent. But combine massive geology, waterfalls, America’s second largest river, and a region oozing with history with world-class wineries, craft breweries, fruit orchards and recreation galore and you’ve got an experience bordering on nirvana. And to top it off, Washington on the opposite side of the river doubles these attributes, including many fine wineries. The Columbia Gorge wine country extends from Hood River to Biggs and features forty-eight Oregon wineries that make a wide variety of cool- and warm-weather varietals. In a nod to the Walla Walla wine region farther to the east, we’ve included one stellar winery on the Oregon side in Milton-Freewater. 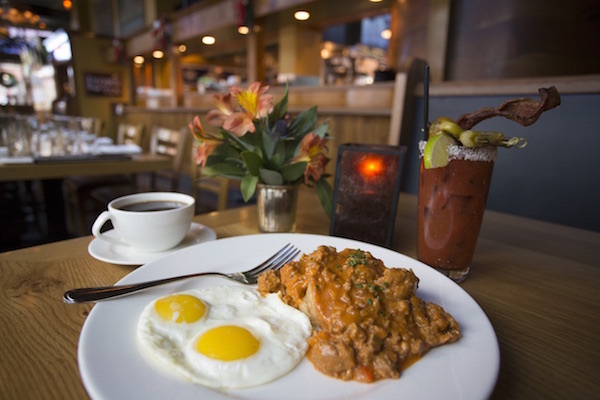 “We’re known for hospitality and wine knowledge,” said Natalie Price, general manager at Solstice Wood Fire Café & Bar in Hood River. She noted that a lot of growth and expansion has occurred in recent years—from new varietals to tasting rooms. She points out that sparkling wines are trending in the Columbia Gorge with Analemma, Viento, The Pines 1852 and others making bubbles that are showing beautifully, she said. Making an appearance in a few wineries, including Wy’East in Hood River, is a popular Chilean wine, carmenere, a varietal that people once thought was extinct but is “wowing” winemakers and drinkers alike, Price said. Less than ten minutes from downtown Hood River, this boutique winery in Mosier makes excellent sparkling wine, as well as still wines that express the cool-climate traits of the area. For an inside look into the winery’s inspiration, settle among the estate vines with the vineyard picnic package, which includes a charcuterie plate, a carafe of wine and a few surprises. 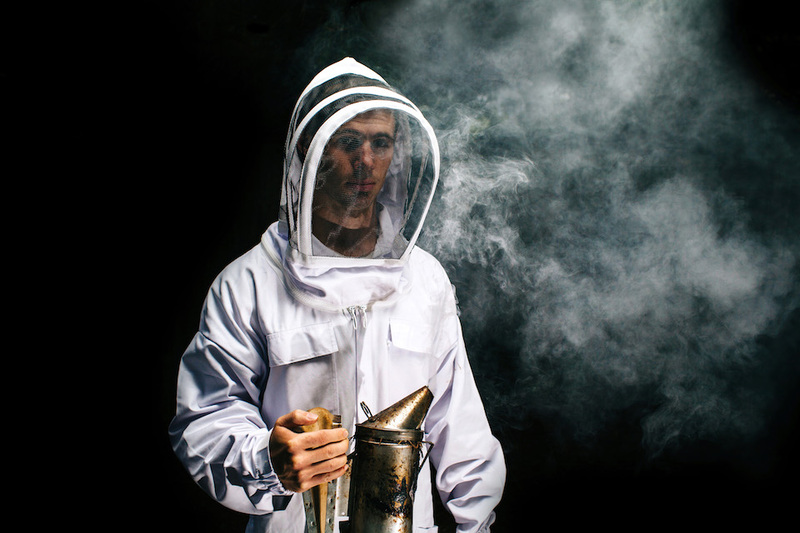 Discover why this team is creating a buzz in the industry. Farm-to-fork at this winery means that everything from grapes and produce to farm animals raised on site will eventually be offered to visitors at the “winefarm” located five miles south of Hood River. Owner Nate Ready, Oregon’s only master sommelier, has been experimenting with several wine types and will release his first vintages this summer at the new tasting room scheduled to open in late May or June. Warm and inviting, the new Stave & Stone tasting room in downtown Hood River embodies fourth-generation farmer and owner Jill House’s winery dream. Her vineyards (formerly apple orchards) are still young, so she buys locally grown grapes and produces wine under a custom crush agreement with Mt. Hood Winery. Order a small plate of nibbles to go with the semi-dry riesling, pinot gris, chardonnay, pinot noir, cabernet sauvignon or premium red blend. The first estate wine, a pinot noir rosé, will be released this fall. A family-owned estate winery on the Oregon side of the Walla Walla Valley, Zerba Cellars is sometimes referred to as “the crazy one in the valley” for its thirty-eight wines, grown from twenty- two grape types, including Italian, French and Spanish varietals. It was the Wine Press Northwest’s top winery of the Northwest region in 2011. With a cool, marine climate, Elkton at Umpqua Valley’s north end earned its own wine growing designation in 2013. Since then, Terry Brandborg of Brandborg Vineyard & Winery said that the tiny berg with its five tasting rooms has noticed an upswing in visitors wanting to sample cool-climate varietals, including pinot noir. In 2015, Wine Press Northwest named Brandborg the Oregon Winery of the Year. Change is coming to Douglas County, and it’s not more bad news about the timber industry. Instead it’s a welcome new trend to accommodate wine travelers who enjoy the Umpqua Valley’s unhurried wine experience and its warm, country hospitality. The valley’s first urban winery in downtown Roseburg—Paul O’Brien Winery— joined forty other wineries in the region. Lee said that such amenities have challenged the area in the past, but the new businesses are springing up, and there’s plenty of opportunity for more. Located entirely in Douglas County, the Umpqua Valley has upwards of 200 microclimates and 140 soil types, according to Scott Kelley, co-owner of Paul O’Brien Winery. A winemaker for twenty-five years in places around the world, Kelley said that with all the variety in the Umpqua Valley, he can’t keep his hands off the interesting grape types grown in the area. The cool zone in the north is ideal for pinot noir, riesling and chardonnay, while the warm southern edge ripens cabernet sauvignon, merlot, syrah and tempranillo. Opened in 2002, the award-winning winery makes pinot noir, riesling, gewürztraminer, pinot gris and white pinot noir. 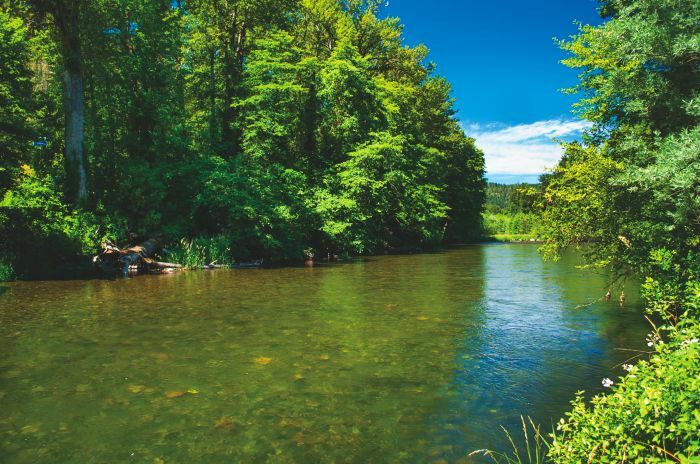 Buy online or stop at its tasting room after a day of fishing on the Umpqua River. One of Oregon’s oldest wine estates, Girardet’s must-try vino is the baco noir, a spicy red that thrives in the Umpqua Valley. All wines are aged and bottled on site—take a picnic while sampling the baco noir and other varietals. The Umpqua Valley’s first urban winery, Paul O’Brien opened in 2013 in the historic 1936 Chevrolet dealership. Its two partners, Scott Kelley and Dyson DeMara, restored it for their winery and tasting room. They source grapes from ten to twelve vineyards in the Umpqua Valley and make pinot noir, tempranillo and fourteen other varietals. Unique chandelier-lit cave for seated tastings in the catacombs. Try the grüner veltliner, an Austrian wine first made in the United States at Reustle-Prayer Rock. And as the name implies, expect Biblical themes throughout, including an actual prayer rock. Before the proliferation of wineries, Southern Oregon grew grapes—lots of them for export to other regions, such as the Willamette Valley. Capitalizing on that niche are custom crushers, which continue to fuel the region’s growth. One such crusher, Pallet Wine Company located in a historic building in downtown Medford, processes about 35,000 cases in thirty-six varietals for clients around the Northwest, according to owner and winemaker Linda Donovan. Pallet’s new tasting room, The Urban Cork, offers tastings of client wines on a rotating basis. Though it boasts Oregon’s first winery (Valley View was founded in the 1850s by Peter Britt), wine growing in Southern Oregon’s fertile valleys was slow to mature. But change is happening “in front of our eyes,” according to Brad Niva who runs Morrison’s Rogue Wilderness Adventures and Wine Hopper Tours, two successful businesses at the intersection of recreation and wine. Marilyn Hawkins of Hawkins & Company, a public relations firm in Ashland, said that with all the variety, she suggests that wine buyers take home a six-pack that may include chardonnay, pinot gris, red blends, merlot, pinot noir and tempranillo. This grand, European- style pavilion is the complete package. Spend a couple of hours enjoying the expansive views of vineyards and the Rogue Valley, the beautiful tasting room and numerous estate-grown varietals. This relatively new winery is not far from Peter Britt’s original site. The 2014 Trata Estate Pinot Noir and 2014 Eleve Pinot Noir both won double gold medals in recent competitions among thousands of entries. Sip the limited production estate-grown pinot noir and chardonnay, with artisan pizzas in a serene setting. This innovative winery was one of the first in Oregon to produce quality wines on tap and has now opened the state’s first combined winery and creamery, Crush Pad Creamery. It offers twelve varietals and blends available only at the winery and in restaurants. Relax in the tasting room overlooking the vineyards and sample cow’s and goat’s milk cheeses paired with wine. Biodynamic, sustainable farming and winemaking infuses every activity from its asparagus crop to its Rhone-style wines. Forbes named its 2014 Spiral 36 white wine value of the year ($28). Wow. Absolutely zero mention of all the wineries in the SALEM area?? Not even infamous WVV. Tsk tsk.